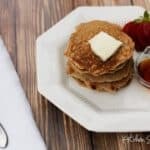 This super-easy pancake recipe will help you ease into gluten-free breakfast cooking! The night before: Mix flour, milk or yogurt, water, and vinegar. You can add coconut oil at this time or in the morning. Leave batter on the counter for 12-24 hours to soak. Sprinkle baking powder, soda, and salt evenly over the top and mix in thoroughly. There should be some bubbling from the interaction of the vinegar and baking soda. Cook on a well-greased griddle over medium heat or so. They act just like your average pancake, getting bubbly (quickly) when time to flip, and then only need 5-15 seconds or so on the second side. Makes LOTS. Maybe 4-5 dozen 2-3” rounds. * Because you’re adding vinegar to the milk, it’s a “fake” buttermilk of sorts and hasn’t had a problem sitting on my counter overnight. Raw milk would be safest for this though if you choose to use milk. You can also use the dairy choice in place of the water for even richer pancakes. I have tried all three options, and I think the milk is the best one, but I often use homemade yogurt. * Feel free to cut the batch in half if you don’t have a large family, but leftovers freeze and reheat well! * Want to do it without any starch at all? See below for a few more variations without the arrowroot. * Dairy-free? You can use all water instead of the milk/yogurt, but it might be too thin. I recommend trying coconut or almond milk in place of at least the dairy milk and maybe the water too.